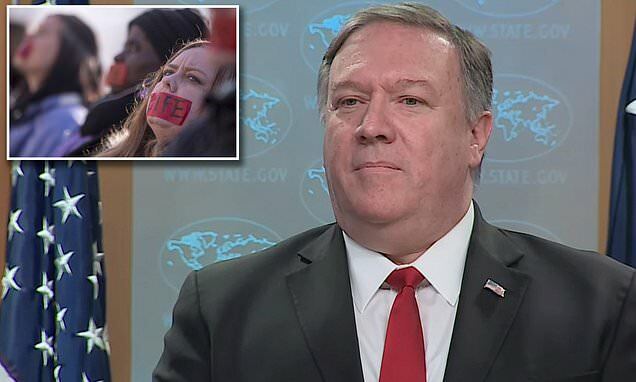 Secretary of State Mike Pompeo put new pressure Tuesday on overseas abortion providers by announcing an expansion of the U.S. policy that stops taxpayer dollars from funding foreign family-planning clinics that terminate pregnancies. Despite the Trump administration's 2017 readoption of what's known as the Mexico City Policy, officials found that some nongovernmental organizations that don't perform abortions were using State Department grants to make pass-through payments to those that do. Opponents of the Mexico City Policy call it a 'global gag rule,' arguing that it prevents U.S.-funded groups from even discussing the availability of abortion as a viable option for pregnant women in the Third World. The policy was first enacted in 1984 and later became a partican punching bag, with Democratic presidents hamstringing it and Republicans enforcing it. Barack Obama formally rescinded it when he became president, only to see Donald Trump reinstate it on his first day in office. A group of 150 Democratic House and Senate women proposed a bill in February that would permanently repeal the policy that has slashed access to abortion at U.S. taxpayers' expense.